Twenty years after Francis Ford Coppola's Tucker, about the maverick car designer, here's another little-guy- vs.-Big-Detroit saga. From producer-turned-director Mark Abraham comes the cautionary tale of Robert Kearns, inventor of the intermittent windshield wiper, and his long campaign to get Detroit to reward his achievement and recognize his genius. 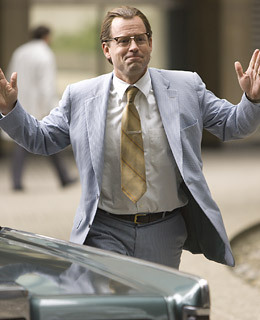 He's played by Greg Kinnear, whose gift is to make even the prickliest obsession likable. (Remember how, as Bob Crane of Hogan's Heroes in Paul Schrader's Auto Focus, Kinnear had a hard time losing his smile no matter how pervy his character got?) Next up, we're guessing: a biopic of the guy who came up with the front-seat cup holder.